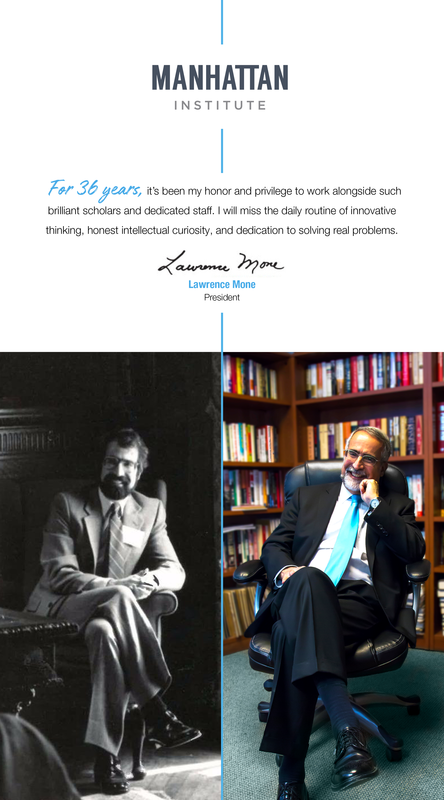 New York City, NY — After more than 36 years of distinguished service at the Manhattan Institute — the last 23 as President — Lawrence J. Mone has announced that he will step down in 2019. "Larry has been a quiet hero behind the Institute's many successes. He has always allowed the research, the ideas, and the scholars to take the spotlight. Larry never wanted to add to the noise; he looked for the moments, the places, and the openings where good policy was needed and where the Institute could truly turn intellect into influence. The Institute and the world of ideas will miss him greatly," said the Institute's Chairman Paul Singer. Under Mone's leadership, the Manhattan Institute has consistently sought to put policy prescriptions into practice. Following the 9/11 terrorist attacks, at the NYPD's request, for example, the Institute launched a new policy division to advise the police on the development of a cutting-edge counterterrorism strategy. In Newark, New Jersey, the Institute partnered with then-mayor Cory Booker to implement a new approach to prisoner reentry, based on the principle of connecting ex-offenders with paid work immediately upon release. In 2012–13, MI experts were embedded in the Detroit Police Department, helping the Motor City implement Broken Windows policing. In 2017, MI launched a project to identify ways to finance charter-school facilities in New York, helping the sector to keep growing and be able to educate more students. Through the years, MI's indispensable magazine, City Journal, has chronicled these initiatives and many others, providing the journalistic response to the issues facing today's cities. Hailed as "the best magazine in America" by the Wall Street Journal's Peggy Noonan and "the great Fool Killer in the arena of urban policy" by the late author Tom Wolfe, City Journal will reach its 29th anniversary in 2019. Mone joined the Manhattan Institute in 1982, five years after its founding, as a public-policy specialist. He moved up the ranks to project manager and then vice president before becoming the Institute's 4th president in 1995. "For 36 years, it's been my honor and privilege to work alongside MI's brilliant scholars and dedicated staff. I will miss the daily routine of innovative thinking, honest intellectual curiosity, and dedication to solving real problems. The Institute's goal has always been to persuade people that ideas matter — and presented carefully, ideas can ultimately change the world. That is not an ideological position; it's the philosophical underpinning of the Institute — past, present, and future." The Institute's Board of Trustees has formed a special committee to select Mone's replacement. Click here and here to read more in The Wall Street Journal.